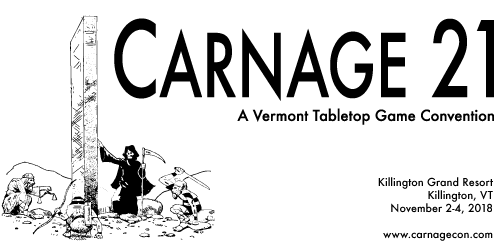 This snuck up fast: Vermont’s premier gaming convention, Carnage 21 is taking place this weekend in Killington at the Killington Grand Resort Hotel. 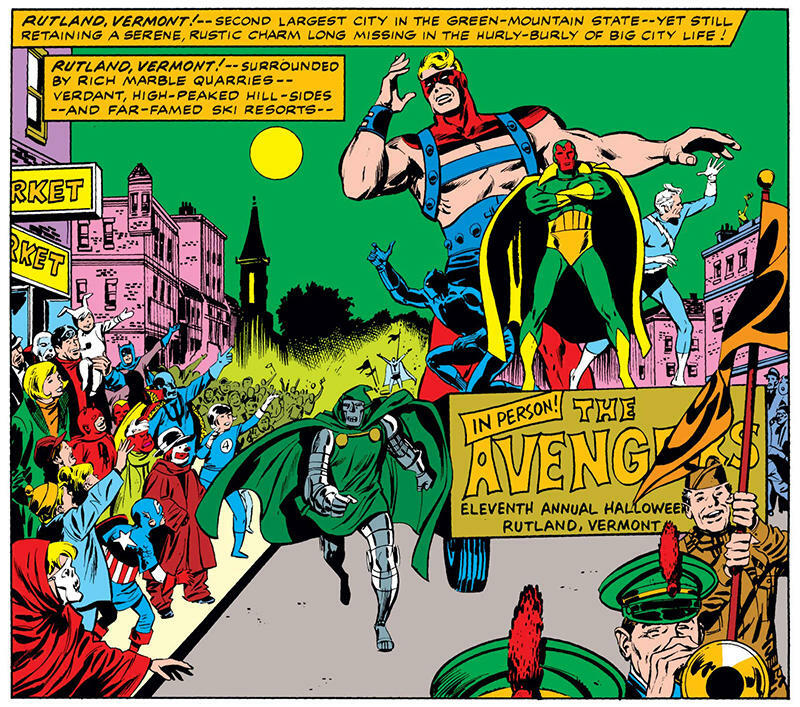 Rutland’s Halloween parade has an out-sized reputation in the comics industry, thanks to a couple of long-standing fans over the years, and has even been featured in comics — it got a nice shout-out in Avengers #83 back in the 1970s. The heroes—Vision, Black Panther, Quicksilver, and Goliath—hit the out-of-the-way city on Halloween evening to chase down reports of a kidnapping plot, and were welcomed enthusiastically by the parade’s organizer, Tom Fagan, who’d invited them to ride on one of the many colorful floats being readied for the event. The Avengers smiled and played along, keeping vigilant watch on the throngs of the costumed attendees who lined the Rutland streets. Read the entire profile here. The parade is actually taking place at 6:30 PM tonight, after being postponed due to the weather last night. This Friday and Saturday: there’ll be a Pulp Culture Comic Arts Festival & Symposium taking place at UVM, put on by the Fleming Museum, University of Vermont, and the Vermont Folklife Center. Guests will include Stephen R. Bissette, Jon Chad, Glynnis Fawkes, Julia Gfrörer, James Kochalka, Rachel Lindsay, Eric Shanower, Rob Walton, Craig Yoe, and others. There’ll also be a pair of keynote presentations by Jaime Hernandez and Julian Chambliss on October 26th and 27th, respectively. Another comic show has popped up in the aftermath of the demise of Vermont Comic Con: the Catamount Comics & Collectibles Expo, which will be held next year on September 14th at the Dudley H. Davis Student Center at UVM. A one day show highlighting artists, comic book creators, writers, comic books and anything collectable. With a family friendly admission price of just $5 for adults and kids under 12 free, come check out local and regional artists, see awesome costumes, and maybe pick up back issues of your favorite comics, or get that toy your parents never bought you as a kid. The event is currently working to fill its tables, saying that vendors can purchase a spot for $100. You can RSVP / remind yourself about the event here. There’s been a handful of new events pop up in recent weeks as organizers work to fill the void of the central gathering point that VTCC grew to become in the last five years. The biggest such event thus far has been the Vermont Sci-Fi & Fantasy Expo, which will take place at the Champlain Valley Expo next April. With Vermont Comic Con melted down, there’s been numerous questions for Vermont SF/F and comic fans: what will replace the event? A contender appears to be the Vermont Sci-Fi & Fantasy Expo, which will be put on by event outfit Vermont Gatherings,. It’ll be held next year on April 27th and 28th at the Champlain Valley Exposition. There’s no other details just yet, but it looks like it could easily fill the void left by VTCC, which ran for five years in Burlington and Barre. What’s more, Vermont Gatherings has a pretty good track record for these types of events, and has steadily added to their portfolio in recent years, encompassing the Vermont Renaissance Faire, the Vermont Living History & Militaria Expo, and the Vermont Steampunk Expo. Hopefully, it’ll put a priority on the local creators and groups in the area. Vermont Gatherings isn’t the only group eyeing the state: a Facebook page popped up for Vermont Pop-Culture Con, although no date has been announced as of yet. Norwich University has a major author stopping by today: John Crowley, who’s written books like Ka: Dar Oakley in the Ruin of Ymr, and others. The series was founded in 2012, and brings major authors to speak at the school about writing. 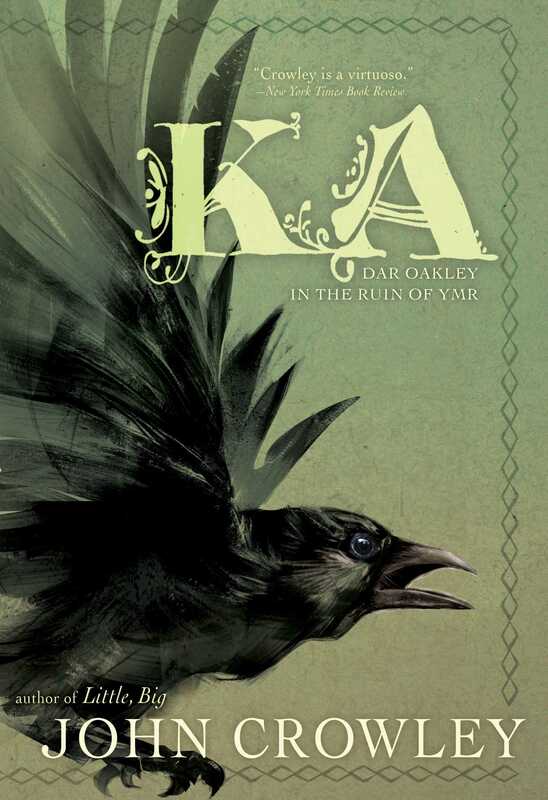 Crowley has written a number of SF/F works beginning in the 1970s, andKa: Dar Oakley in the Ruin of Ymr is his latest. I haven’t personally read it, but the friends of mine who have have raved about it. Crowley will be speaking at the Chaplin Hall Gallery at 4PM on Norwich’s Northfield campus. The event is free and open to the public. The University of Vermont has announced the 16th annual Tolkien at UVM conference. Run by Christopher Vaccaro, it’s a small academic conference devoted to the works of J.R.R. Tolkien. This year’s conference is titled Tolkien and Horror, and will be held on April 6th, 2019. The conference is currently accepting abstracts and session proposals (those re due by January 15th, 2019), and this year’s keynote speaker will be Professor Yvette Kisor of Ramapo College. Details / RSVP can be found on Facebook.